Winner of the 2012 Wilbur Award for Youth Books, the Best of KidSpirit Online, Volume 1, contains 112 pages of the best teen writing, poetry, and art on the Web. The collection features the most reflective, inspiring content published by youth at KidSpirit in its first year online. What do teens think about cheating? How do youth approach depression or becoming vegetarian? How do traditional religious backgrounds influence young people’s choices and character development? 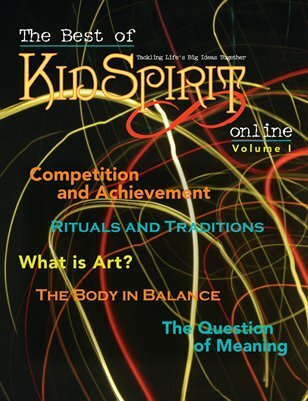 Teens answer these questions and more in articles from KidSpirit’s first five online issues: Competition & Achievement, Rituals & Traditions, The Body in Balance, Finding Your Spirit in Art, and The Question of Meaning. Read the articles, then visit us at kidspiritonline.com to submit your own work!